This Excel VBA tutorial explains how to use Worksheet.Select Method to select a single worksheet or multiple worksheets. When you click on a worksheet tab, the worksheet is highlighted. To select multiple worksheets, you can hold down Ctrl and then left click the mouse on each worksheet tab. One practical use of selecting multiple worksheets is to print selected worksheets. In this tutorial, I will explain how to perform the same tasks in the above scenarios using Excel VBA Worksheet.Select Method. In Excel VBA, it is not necessary to select worksheets in order to run a Macro on selected worksheets, because you can use VBA to loop through worksheets with specific name. Replace Optional Variant (used only with sheets). True to replace the current selection with the specified object. False to extend the current selection to include any previously selected objects and the specified object. After you have selected all worksheets, you can deselect them by selecting anyone of the worksheet. To avoid specifying which worksheet, I use ActiveSheet in the below example. 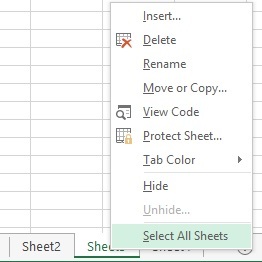 In multiple selection, ActiveSheet refers to the first selected worksheet. You can also select multiple worksheets using Array.